Mumbai: Millionaireasia India, India’s leading luxury magazine organized a one of its kind 2-day event; Millionaireasia Regatta and Fundraising Charity Gala dinner on February 25th and 26th, 2018. Millionaireasia India Regatta was organised to give an unparalleled experience to the exclusive gathering. The Associate Partner for the prestigious event was Swiss International Airlines; the airline of Switzerland that serves over 100 destinations in 43 countries carries more than 16.5 million passengers a year with its 91-aircraft fleet. The memorable event was powered by Visit Monaco and Visit California. While Visit California is the non-profit organization that keep California the top-of-mind as a premier travel destination, Visit Monaco is the Monaco Government Tourism Bureau that promotes the destination that is home to some world-class entertainment, glamorous clubs and indulgent casinos. On the first day there were 15 boats who participated in the Regatta which took 3 hours to complete. Team, The Premier Cru for Millionaire Asia India crossed the finishing line in the least amount of time (1 hour 55 minutes and 38 seconds). The 1st runner up was Tengi followed by the 2nd runner up; Avi’s Arc for Team Swiss Air. The Regatta was followed by a relaxed evening at The Royal Bombay Yacht Club. Teams and guests of leading brands like Swiss airlines, Visit Monaco and Visit California participated in the Regatta, along with other professional sailors. On day two a fashion show was organized where the renowned fashion designer Pallavi Jaikishan showcased her latest collection Aayat which was further divided into The Déjà vu, Eternal, Silver Storm, Bedazzled and Here comes the bride collection. This was followed by a Charity Gala Dinner with an aim to create an awareness about cancer. “This year we have also associated with ‘Festival of Hope’ an organization that creates awareness for all types of cancer, as a way to give back to our society”, she added. The magazine collaborated with ‘Festival of Hope’ organization to create awareness for all types of cancer via various initiatives. They believe in celebrating the courage and spirit of cancer survivors. 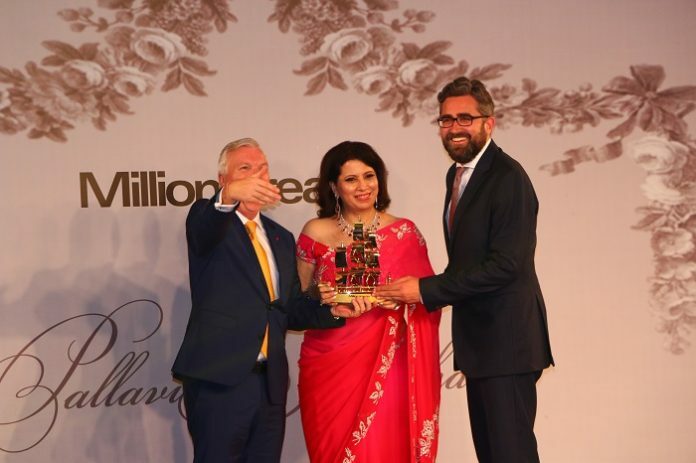 Millionaireasia India is a ‘by invite only’ magazine which reaches out exclusively to the ultra-rich millionaires and HNIs who live a life marked by indulgence. It is for the intelligent, suave and ultra-glamorous Millionaires. The magazine is sure to lure all with its fun, playful and bold attitude. It’s about living life to the fullest, spending lavishly, creating memories and relishing experiences that last a lifetime. It features everything a business savvy contemporary would be interested in – be it features on investment, wealth management, insurance, CSR, besides other gamut of lifestyle indulgences such as cars, jets, yachts, watches, fashion, art and travel destinations.